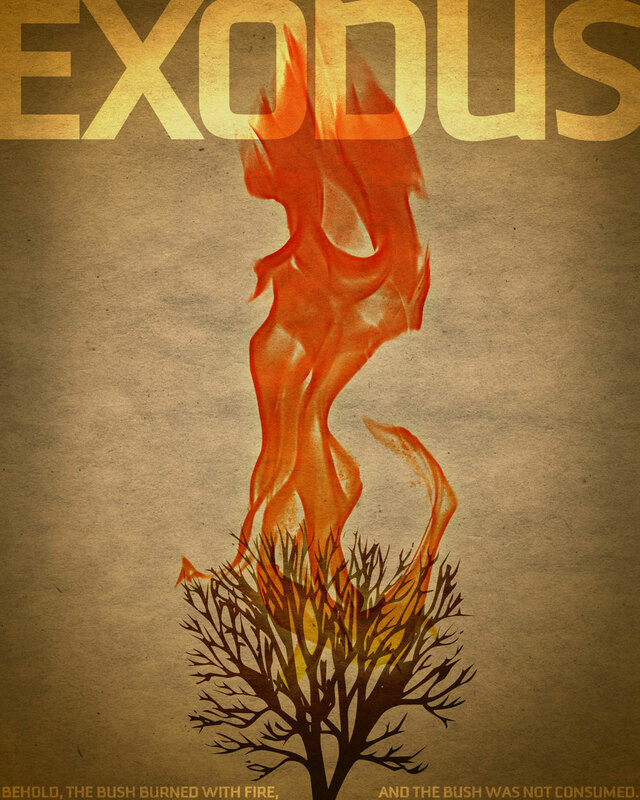 Much like Genesis, Exodus is full of rich characters and great stories. Moses, the Ten Plagues of Egypt, the Parting of the Red Sea, the Ten Commandments, etc. It's tough to know which one to pick. Although I ended up going with God chatting with Moses via burning bush, that wasn't my first choice. I originally wanted to do the Ten Plagues, and actually worked on the design for a while. I had a PSD file full of plagues – locusts, frogs and lightning bolts. But in the end, it just felt cluttered and disconnected (plus I was struggling to figure out how to use boils, blood and a bunch of dead cows as design elements), so I decided to go in a different – and less deathy – direction. But before I get into Exodus and the burning bush, I have one slight observation/tangent. A talking snake that duped the only 2 people on earth into eating a fruit that they weren't supposed to eat. Fallen angels mating with human women and having crazy giant babies (Nephilim). A woman turns into salt because she looked the wrong way. Bread that materializes out of nowhere. Every morning. In the Desert. One day a sea splits in two forming a dry path so a bunch of people can walk through. The next day when a bunch of other people try to walk through, the sea closes up and they die. That stuff is bizzare. How did I not notice that as a kid? Anyways, that brings me to the Exodus design, which is another weird story. Moses is out shepherding one day and all of a sudden God starts talking to him from a bush that is on fire, but apparently isn't being burned up? And then Moses proceeds to have a conversation with the burning (yet not burnt) bush. What the heck? The Bible is starting to feel like a David Lynch movie.